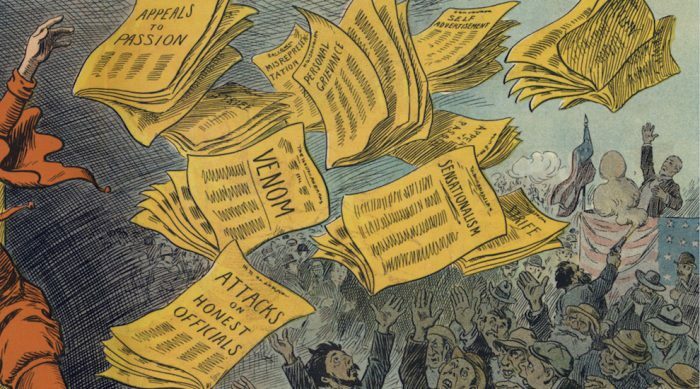 May 4, 2018, 8:58 a.m.
By Laura Hazard Owen @laurahazardowen May 4, 2018, 8:58 a.m.
People prone to psychosis are also more likely to believe fake news. Is there a certain kind of person who is more likely to believe fake news? Yes: “Belief in fake news was associated with increased endorsement of delusion-like ideation,” according to a working paper from Yale’s Michael Bronstein, Gordon Pennycook, Adam Bear, Tyrone Cannon, and David Rand, presented at the recent Schizophrenia International Research Conference. Two studies with over 1,000 participants suggested that individuals who endorse delusion-like ideas (e.g., thinking that people can communicate telepathically), as well as dogmatic individuals and religious fundamentalists, are more likely to believe fake news. These studies also suggested that two related forms of thinking may protect against belief in fake news: The first, actively open-minded thinking, involves the search for alternative explanations and the use of evidence to revise beliefs. The second, analytic thinking, involves deliberate thought processes that consume memory resources. Reduced engagement in these forms of thinking partially explained the increased belief in fake news among individuals who endorsed delusion-like ideas, and fully explained increased belief in fake news among dogmatic individuals and religious fundamentalists. 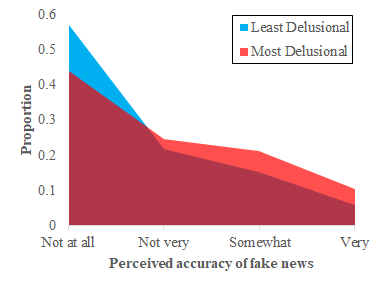 These results imply that existing interventions designed to increase actively open-minded and analytic thinking might be leveraged to help prevent the deleterious effects of belief in fake news. The researchers used Mechanical Turk to study two groups of 500 people. 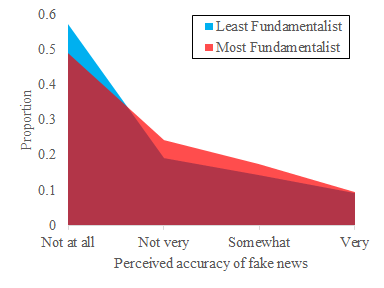 They were asked to rate the accuracy of 12 fake news headlines as well as a set of real news headlines, and were also tested on four other measures: a shortened version of the actively openminded thinking scale, a measure of dogmatism (“The things I believe in are so completely true, I could never doubt them”), a measure of religious fundamentalism (“The basic cause of evil in this world is Satan, who is still constantly and ferociously fighting against God”), and the Peters et al. Delusion Inventory (questions like “Do you ever feel as if there is a conspiracy against you?”) And they took the cognitive reflection test. Participants in the second group of people also took two additional tests. (i) Correlation vs causation — We definitely can’t (and aren’t trying) to say that being delusional, dogmatic, or a religious fundamentalist causes you to believe fake news. What we definitely are saying is that these things tend to co-occur. In terms of what causes what, we can’t say anything definitive. What we do is provide circumstantial (correlational mediation) evidence that supports a story whereby being less open-minded/reflective leads simultaneously to all of these things — delusionality, believing fake news, being dogmatic, and being a religious fundamentalist — and explains some/all of why they are correlated with each other. (ii) The size of the correlations isn’t huge. That is, it’s not like “Oh, you scored highly on the delusionality scale, so that means you’ll believe all fake news headlines” or “oh, you are a religious fundamentalist, so you’ll believe all fake news headlines.” But at the same time, the correlations aren’t nothing. “Misogyny is both the input and output that keeps the fake news industry afloat.” For Refinery 29, Nicola Pardy argues that “the use of women’s imagery in the fake news industry points to a…system of gender-based degradation.” I’m not totally convinced by the stories presented here — I’m not sure misogyny is worse in this environment than it is elsewhere, and this story didn’t convince me otherwise — but I am fascinated by how gender and misogyny play into the creation and spread of, and our conversations about, misinformation, and I’d love to see more research into it. “Women over 65 years write very rude things on the internet.” This somewhat surprising headline in Svenska Dagbladet was also the conclusion after one year of work by the Swedish network for research on hate on the internet, Nätverket Näthatsgranskaren. They too were surprised by this finding. Their best explanation was that these women are the true victims of ‘fake news.’ They are not accustomed to fake journalism-like content, they are not trained in investigating the sources and, they believe in what they read. The original article is here; from what I can tell after a bunch of Google Translating, it seems that the network, which monitors social media for hate speech and threats, has traced a surprising number of these threats to older women. In 2017, the network “made 770 police reports against about 600 different people. The number of suspected crimes amounts to almost 2,000,” the Swedish newspaper Eskilstuna Kuriren reported. About 15 to 20 percent of the suspected crimes were attributed to women, according to that article. POSTED May 4, 2018, 8:58 a.m.
Owen, Laura Hazard. "People who are delusional, dogmatic, or religious fundamentalists are more likely to believe fake news." Nieman Journalism Lab. Nieman Foundation for Journalism at Harvard, 4 May. 2018. Web. 25 Apr. 2019. Owen, Laura Hazard. "People who are delusional, dogmatic, or religious fundamentalists are more likely to believe fake news." Nieman Journalism Lab. Last modified May 4, 2018. Accessed April 25, 2019. https://www.niemanlab.org/2018/05/people-who-are-delusional-dogmatic-or-religious-fundamentalists-are-more-likely-to-believe-fake-news/.